Veterans Support: Truth or Fantasy? One of the benefits of being assigned far away from any military post is that I get invited to local events. 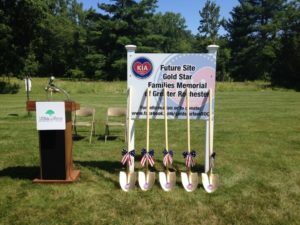 Last week, I was invited to attend the ground breaking ceremony for the Gold Star Family Memorial in Rochester, New York. I was honored to represent the Army and the ceremony was moving with five local area families of fallen service members honored. One of the highlights of the event for me was getting to meet SGT Gary Beikerch, a Rochester native who received the Medal of Honor for his actions in Vietnam and whose painting is prominently posted outside my office door. The memorial is partially funded and donations are certainly welcome (information found on their page located here). I have been thinking about this event for the past week and the people I have met since I have arrived here. There is a great deal of angst right now about Veterans issues, particularly anything to do with the Veterans Administration and their real and perceived shortcomings. Some of the criticism is much deserved and has been covered here in Havok Journal but I have begun to wonder how much of it is a self-perpetuating cycle of suspicion and condemnation out of proportion with reality? A couple of things have recently occurred which has me questioning the ‘conventional wisdom’. Here in Rochester, one cannot turn a corner without running into a well maintained military memorial. There are no fewer than three veteran memorial parks in this area, an amazing Vietnam and Korean War memorial, and several locations named after prominent local area veterans. The city and county maintains its own veteran affairs service organization in addition to the Federal and State VA system, veteran regional business council, a veterans Court, several charities including Honor Flight – a non-profit organization which flies elderly veterans across the country to see memorials and events – and several veteran fraternal organizations including AMVETS and the American Legion. I have been to several events and locations and have been floored by the level of support from the community. This support seems genuine and enthusiastic, much of it from people which never served a day in their life. Friends of mine before I came back to New York went out of their way to cast aspersion upon the ‘liberal’ northeast but frankly, I haven’t been to a place where I have seen this level of real community support of veterans and demonstrated patriotism. As for the sloppy and inefficient VA system, I recently had my first interaction. An acquaintance of mine contacted me and asked for support for a former soldier who was having a difficult time. This call came well after midnight and I called the national VA emergency hotline and within 30 seconds I was in touch with a professional response coordinator out of the local VA hospital. This person was amazing and cutting to the end of the story, the soldier received the help that they needed in a surprisingly short time. I told this story to local veterans which I have had the privilege to meet and they confirmed the support they have received from the local veterans affairs has been exemplary. There are real tragedies out there and far too many veterans who have been let down during a time of need. When these things happen, it is up to us as a community to point out the short comings and for the nation as a whole to hold people accountable. But I also believe in giving credit where credit is due and in the past couple of months I have seen a ‘horrific Kafkaesque’ VA system help save someone’s life with alacrity and care. The same organization backed my home loan to buy the first house I have ever owned. I have also seen the children of veterans going to college on their parent’s GI Bill benefits administered by the same organization. I have made my home in a community where there is an amazing level of support and where the representatives of both political parties gladly stood next to each other to honor veterans. I know problems exist and I have only my experiences to go on but I wonder if we are focused on just the problems and are quick to ignore what may be the reality – that for the most part, there is good care available and our government and society really do have our back.